I am not really familiar with the book of Philippians – but I do know that it is a Pauline epistle written to the Church of Philippi. Aha. As Philippians is known to be one of the 4 Prison Epistles of Paul, the letter was most probably written when Paul was imprisoned. Purpose of the letter, hence, is to comfort and encourage them. You can ignore my last few unconfident statements about the book, but if you have to take away something, remember this – the theme of Philippians is joy, and can really be summed up by Philippians 4:4 – Rejoice in the Lord always. I will say it again: Rejoice! Bear that in mind, but we’re not going to focus on joy in this study. We will discuss Philippians 4:4 in proper one day. Let me remind you again that the theme of Philippians is joy. 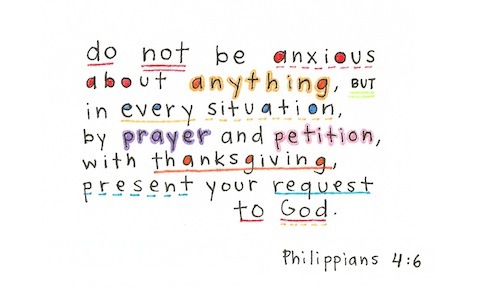 Okay, going into 4:6, do not be anxious about anything – right, in other words, don’t worry. Matthew 6:25-34 is one of the most prominent passages on the topic of worrying; Who of you by worrying can add a single hour to his life? . It isn’t that we shouldn’t care at all, but that we ought to free ourselves from dwelling in anxiety through the understanding that God is in control. It’s not that God will definitely heal your sickness or rescue you from the pit. It’s just that God has the best plan in mind, and He will execute it, whether we understand or not. Worrying offsets joy. Maybe I am wrong, but as far as I am concerned, one cannot be joyful when one is worrying. Joyful worrying? Wow. If worrying and rejoicing are mutually exclusive, then worrying becomes an obstacle to rejoicing, and rejoicing becomes an obstacle to worrying. How do you stop yourself from worrying? Be joyful in hope [Romans 12:12|Article]. What do you get when you stop worrying? More joy. When you simplify the equation, at least. There’s another important thing to do in order to free ourselves from worries – but in everything, by prayer and petition, with thanksgiving, present your requests to God. Pray. There are many types of prayer, but our prayers today are generally of three main types – Petition (asking God for something), Intercession (praying for others), and Thanksgiving (thanking God for something). Petition is probably the most common type of prayer, and here Paul tells us to pray and ask God to deliver us from whatever we’re worrying about; to deliver us from our worries. Prayer of petition occurs in times of need and want, and we know that God will provide us with all our needs. As Matthew 7:7 reads – Ask and it will be given to you; seek and you will find; knock and the door will be opened to you. With thanksgiving – again another form of prayer. Probably the easiest, but the one we take most for granted. We can never run out of things to thank God for, can we? Yet a thankful heart needs to be cultivated, less we turn into people who merely petition out of greed and selfishness. Even in petition, we ought to nurture a grateful heart. In asking for deliverance from our illness, we can be thankful for the health that we’ve enjoyed thus far. In asking for supply to our needs, we can be thankful for the hand that supplies. You know how children pray so innocently, “thank you Father for my eyes that I can see, for my ears that I can hear, for my nose that I can smell” etc? Perhaps that is what Jesus means in Luke 18:16. Again, thanksgiving ought to be done in sincerity and joy. Do not thank God merely because the Bible tells you to. Learn genuine gratitude, because God will surely be able to tell your heart. If you feel your heart with things to be thankful of instead of things to be worrying about; you are changing your attitude into positivity, and naturally, joy will enter into your heart. Let your requests be known to God – requests here refers to prayers, your petitions. Surely God does not require us to tell Him our necessities? He already knew beforehand. But God wants us to come before Him, God wants us to turn back to Him. So the purpose in letting our requests be known to God is not to inform Him, but to turn back to Him. Make your requests known to God, and not man. Depend on God, and not man, for it is better to take refuge in the Lord than to trust in man (Psalms 118:8). Lastly, we do this in everything. This is placed in direct contrast to do no be anxious in anything. Stop to consider for a second what does everything encompass of? A really silly question actually. Your mind, your heart, your will, your body, your career, your education, your family, your community, your wealth and possessions, your pen sitting at the corner of your desk… really, everything means anything you can think of, and all the things that you can’t think of. What do we do in everything? We pray and petition and give thanks with a joyful heart (remember the theme of this book). Well, let’s take a second to scoff because this is a mountain to climb. Is this possible? Perhaps we may think that we can petition for all that we need and want. But to give thanks for everything? I think even if we use 24 hours a day to pray, we wouldn’t have exhausted even 1% of the list of things to pray about. However, I believe that in asking us to give thanks in everything, it mainly means that if you are going to think about something, rather than worrying about it; rather than complaining about it, you should give thanks for it instead. If we use all the time that we would spend on worrying on thanksgiving instead, we will be able to thank God for so much more. Some translations use the term ‘every time’ instead of everything – it’s the same idea, really. Always be thankful, always pray.